The Buddha was a charismatic leader who discovered and proclaimed a religious message and founded a distinctive religious community. Some of the members of that community were, like the Buddha himself, wandering ascetics. Others were laypersons who venerated the Buddha, followed those aspects of his teachings that were relevant to them, and provided the wandering ascetics with the material support that they required. 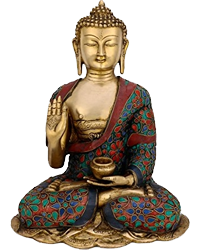 During the first several centuries after the Buddha's death, the story of his life was remembered and embellished, his teachings were preserved and developed, and the community that he had established became a significant religious force. Many of the followers of the Buddha who were wandering ascetics began to settle in permanent monastic establishments and to develop the procedures needed to maintain large monastic institutions. At the same time, the Buddhist laity came to include important members of the economic and political elite. During the first century of its existence Buddhism spread from its place of origin in Magadha and Kosala throughout much of northern India, including the areas of Mathura and Ujjayani in the west. According to the Buddhist tradition, invitations to the Council of Vesali (Sanskrit: Vaishali), held just over a century after the Buddha's death, were sent to monks living in many distant places throughout northern and central India. By the middle of the 3rd century BC, Buddhism had gained the favour of a Mauryan king who had established an empire that extended from the Himalayas in the north almost as far south as Sri Lanka. To the rulers of the kingdoms and republics arising in northeastern India, the patronage of heteroprax sects (those with differing practices) was one way of counterbalancing the enormous political power enjoyed by Brahmans (high-caste Hindus) in the affairs of state. The first Mauryan emperor, Candra Gupta (c. 321-c. 297 BC), patronized Jainism and finally became a Jaina monk. His grandson, Ashoka, who ruled over the greater part of the subcontinent from about 270 to 230 BC, became the archetypal Buddhist king. Ashoka attempted to establish in his realm a "true dhamma" based on the virtues of self-control, impartiality, cheerfulness, truthfulness, and goodness. Though he did not found a state church, he did attempt to forge a Buddhist-oriented religiopolitical culture that would include Hindu, Jaina, Ajivika (Aivaka), and Buddhist alike. His aim was to create a religious and social milieu that would enable all "children of the king" to live happily and attain heaven in the next life. Thus, he created a "welfare state" by setting up medical assistance for men and beasts, maintaining reservoirs and canals, and promoting trade. A system of dhamma officers (dhamma-mahamattas) was set up to provide for the empire magistrates, district attorneys, preachers, bureaucrats, social workers, and spies. The lay ethic preached by the king of the dhamma (dhamma-raja) and his officers was focused on the layman's obligations in this world. Though Ashoka created a new ideal of kingship that would have powerful repercussions throughout the later Buddhist world, the various problems posed by a state of such vast dimensions in India proved greater than he could solve. Soon after Ashoka's death, the Mauryan empire began to crumble. Although Buddhists seem to have suffered some persecutions during the subsequent Shunga-Kanva period (185-28 BC), Buddhism succeeded in maintaining and even expanding its influence. Buddhist monastic centres and magnificent Buddhist monuments such as the great stupas at Bharhut and Sañchi were established throughout the subcontinent, and these institutions often received royal patronage. In the early centuries of the Common era, Buddhism was especially flourishing in northwestern India, and from there it spread rapidly into Central Asia and China.